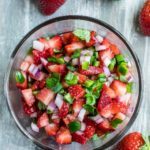 This easy Strawberry Salsa recipe is fresh, delicious, and totally addictive! It makes a great appetizer for parties and picnics and tastes amazing over shrimp, chicken, fish, salads, tacos, and so much more! Hull and chop strawberries and combine with minced onion. Remove stem, seeds, and ribs from jalapeño, mince, then add to your berries. Add freshly squeezed lime juice, a drizzle of evoo or avocado oil, and as much fresh cilantro as you’d like! Lastly stir in a pinch of salt (adjust to taste) and a little black pepper (optional) and toss it all together. Serve over your choice protein, salad, tacos, or dive in with chips as a snack! This salsa is a bit legendary with cinnamon sugar pita chips. You can even add chopped pineapple or mango to the salsa if you have some on hand – it’s amazing! Feel free to double or triple this recipe as needed for all your salsa shenanigans! I skipped adding any sort of sweetener to keep this strawberry salsa Vegan, Paleo, Whole30, and Keto compliant. If you'd like to add a bit of sweetness that's a-OK! A few teaspoons of honey or maple syrup makes a wonderful addition if desired and can also sweeten up less ripe berries. The riper the berries the sweeter the salsa will be!